The Politics of a National Cathedral in Ghana: A Symbol of a Corrupted Government, or Reaching Wakanda? The plan to build a National Cathedral has sparked intense debate on the relationship between the political and the religious elite in Ghana, writes George M. Bob-Milliar and Karen Lauterbach. The National Cathedral project symbolizes a new, more direct and visible linkage between the Christian and political elites in Ghana. At the same time, the reactions it has provoked show a strong scepticism towards this tendency among Ghanaians. Artist’s impression of the planned cathedral in Ghana. Source: FT. It is not a new observation that religion plays an important public and political role in Africa. Religious leaders and institutions have been key in political processes of democratization in which they have, for instance, educated the electorate on democratic principles and voting and acted as the moral consciousness of society. In Ghana, the Christian Council of Ghana (CCG) and the Ghana Catholic Bishops’ Conference (GCBC) have historically defined their role as the moral watchdog of society, addressing violations of human rights and social injustice (Yirenkyi 2000). More recently, Christian and Muslim organisations came together to organise peace marches ahead of the elections in 2016. Ghana is a secular republic, and sitting presidents have been careful to make their public appearance religiously plural in order to pay equal attention to the major religious communities. Nevertheless, it is a general perception that Christian leaders in particular are close to the political elite as Christianity is the dominant religion in the South from which the majority of the political elite hails. The building of a National Cathedral in Accra touches upon and disturbs the historical self-perception of Ghana as a religiously plural country. A national Cathedral will prioritise Christianity when this form of religious space and symbolism is transformed to signify national strength and national legacy. We argue that this is an example of religion ‘hijacking’ politics in the sense that the role religious institutions have historically played are changing. Moreover, the established boundaries between the two fields are challenged by a Christian and a political elite that both see advantages in drawing on each other’s capital and legitimacy. At the same time, it is important to note that this development is not generally accepted in Ghana and there is a widespread concern about the state becoming too enmeshed with the Christian elite (particularly the Pentecostal and charismatic elites). The idea of constructing a National Cathedral was launched by president Akufo-Addo in March 2017 as part of Ghana’s 60th anniversary celebrations and as part of a series of so-called legacy projects. The National Cathedral is presented as a national non-denominational Christian worship centre, and is planned to consist of a place of worship, a community hub, chapels, baptistery, an art gallery and Africa’s first Bible museum. The project is designed by the renowned British-Ghanaian architect David Adjaye. The Cathedral will sit on some six hectares (14 acres) of prime state land, starting from the Ridge roundabout area and extending to the western side of the State House/Parliament House. There was no formal consultation with civil society organisations and the Catholic bishops expressed disappointment they had not been heard. However, the President “invited” some men and woman of God who were known to be party sympathisers to form the Cathedral Trustee board. The 13-member board was inaugurated by the President, and is chaired by the Most Rev. Samuel Asante Antwi, a former Presiding Bishop of the Methodist Church of Ghana. He is assisted by the Catholic Metropolitan Archbishop of Cape Coast, the Most Rev. Charles Palmer Buckle, and the secretary of the board is Prophet Kusi Boateng, the Founder and General Overseer of Power Chapel Worldwide. Other members of the board include prominent Pentecostal pastors such as Pastor Mensa Otabil (Founder of the International Central Gospel Church); Apostle Dr Opoku Onyinah (Chairman of the Church of Pentecost and President of the Ghana Pentecostal and Charismatic Council) as well as representatives of the Methodist church. The board was tasked to focus on three main areas, namely the design of the project, supervising the construction and raising funds for the project. 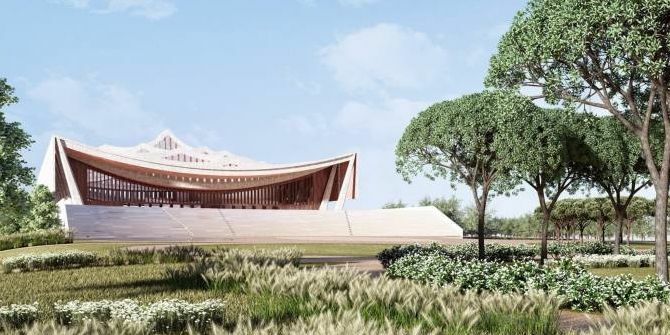 The proponents of the project argue that the National Cathedral is both a symbol of a rising Ghana, and that it will in itself make Ghana rise; it will boost the economy, consolidate democracy and be an inspiration for other grand national projects. It will be a symbol of the richness of the past and the prospects of the future. As Professor Okeke-Agulu has argued in the New York Times, the Cathedral will be a space where “religion, democracy and local tradition are seamlessly and symbolically intertwined”. This line of argument focuses mainly on what the building and the space per se signify. It is talked about as a national symbol and as a space in which democracy, spirituality, and a Ghanaian cultural heritage can meet and be expressed. Moreover, the fact that the architect is a Ghanaian himself is important. It shows that Ghana can reach the league of grand nations, not as a copycat, but rather as a country that points to the future and in which political ideas and spirituality can go hand in hand. As President Akufo-Addo said at a recent fund raising event for the Cathedral: “The Cathedral will also provide a platform to promote deep national conversations on the role of faith in building the progressive and prosperous Ghana we all want. I am convinced that out of these conversations would emerge ideas and values that should help us build a new Ghanaian civilization”. Those who are not so convinced about Ghana reaching Wakanda through the building of a National Cathedral question the politics behind the project and highlight the ethical dilemma in spending money on this kind of project when the basic social needs of Ghanaians are not being met by the government. Despite the reassurance of the government that the Cathedral will not be built with public finances, critical voices point to the value of the land that is given to the project. More importantly, these critical voices also sound the alarm for what they see as an unhealthy close relationship between Christian leaders and the government and the problems that might arise from a building that is promoted as a national site also being a Christian building. Does this destabilize the enduring and fragile respect for religious plurality in Ghana? A related question is whether this project also signals a threat to the religious independence of the state. Are we seeing a Pentecostalisation of the Ghanaian republic, as Ebenezer Obadare has forcefully argued is the case in the Nigerian Fourth Republic? There is no doubt that the project has brought the political links and role of Pentecostal and charismatic pastors in the spotlight. The critics of the project have been called anti-Christian, which is typical of Pentecostal rhetoric. Moreover, this kind of project where the state promotes a certain religion can be seen as a kind of vote buying and some go as far as calling the National Cathedral the beginning of Akufo-Addo’s 2020 election campaign. The “Battle is the Lord’s” was the 2016 campaign slogan of the President’s party (National Patriotic Party) that cemented the links between the party and the Christian voters. While in government, the President has gotten closer to several men of God including the controversial preacher, Owusu Bempah. The National Cathedral and the ever-less-hidden links between the President and certain Pentecostal/charismatic leaders is a sign of Ghana going in the direction of being an enchanted democracy, as seen elsewhere on the continent (such as Nigeria and Zambia). The case reveals an interesting crossover of two dominating trends in which culture, religion and politics merge, namely the ambition to create and define the future of civilization in Africa and the emergence of a theocratic-political elite. George M. Bob-Milliar is a senior lecturer based at the Department of History and Political Studies, Kwame Nkrumah University of Science and Technology, Kumasi-Ghana. Karen Lauterbach is Associate Professor at the Centre of African Studies, University of Copenhagen. Note: This piece gives the views of the author(s), and not the position of the LSE Religion and Global Society blog, nor of the London School of Economics.